Morgan came over to play today. The girls have so much fun together. However after reading books about Franklin going to the hospital, they were bound to catch some serious pretend illnesses. Fortunately Dr. Morgan & Dr. Norah were on the case. Although judging from the look on Dr. Norah's face, I don't think the prognosis is good. Oh well, I'm sure they will come up with a cure eventually... I had no time to help, I have been tirelessly editing & organizing photos for a certain birthday girls photo slide show. I should probably start on her baby book, damn. What a great weekend! We had some visitors, not just any visitors but the Uppys! Four of our very favorite people! In honor of our babies getting together we dressed them as twins! Seren is so cute!! This week has been pretty good. I have got a lot done & managed to get the kids out of the house a few times to play. We have even decided to give in to Ava's strong social desire and enroll her in preschool, albeit only 3 hours a week, she is still super excited! I have been on a tear to get this house organized! Every last cupboard, drawer and closet better watch out! I'm coming for you!!!! My mission is to reduce our "stuff" by at least 15%, I can almost taste the victory now! I really haven't been taking any pictures this week outside of crappy cell phone ones but I will leave you with this, because what is a post without photos? Oh and by the way, Norah can say: Dada, Kitty, Sit Down, This & several other sounds that I think are words. She has even said "Ava" twice now. MAMA!!!! How frickin hard is that??? Who takes care of you child?? sick but pretty much better now. Ava "I REALLY like being naughty!" Ava "Because it's SO FUN!! I can do what ever I want! And then you yell at me, well that's the part I don't really like, you yelling at me." Ava told me she is never going to talk to me. Come live vicariously through us, last chance. 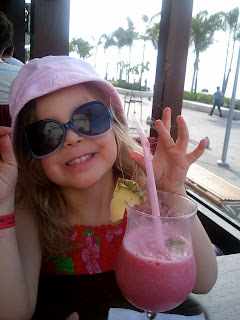 So this is it, the last installment of our amazing trip to Puerto Vallarta. On Wednesday Dad, Angi & I took a bus into town for a local Art Walk. It was really fun, we got both a lot of walking and a lot of art in. : ) It felt a little brave as we scoured through the narrow streets on what felt much like a scavenger hunt, looking for the next art gallery on our map, in the dark. The next day Dad & Jessica went on a 3 hour zip line tour which I really should of gone on too. They had a wonderful adventure and I am so glad they got the opportunity to do it, together. Next time I must try it too, what a cool thing to do! : ) In the mean time, John & I took the kids on the bus back into town for our own little adventure. It was a nice little family outing walking the water front and checking out the parasailers and all the cool statues along the beach.